Spring Break might only be seven days long, but just one day in Little Tokyo provides endless possibilities for exploration and exposure to another culture without having to leave Los Angeles. With unlimited eateries, museums, exhibitions, and an outdoor walking retail district, Go Little Tokyo provides a convenient and budget-friendly adventure close to home. Experience an action-packed day of memorable experiences and immersive lessons suitable for kids and just as fun for adults and teens in tow. Go Little Tokyo presents a curated lesson plan of the top five reasons to Spring Break in one of LA’s most vibrant neighborhoods. ARTS & CULTURE: Japan LA, a boutique anime culture shop, provides an insider’s look into the crossover of Japanese and Los Angeles pop culture. Venture through aisles full of toys, apparel, and accessories, and discover the gallery in the back of the store showcasing the best in “kawaii” (cute) art from all over the world. 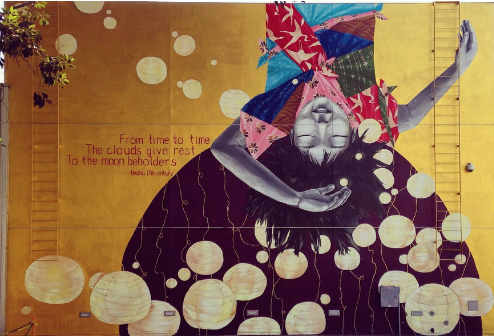 Continue on an art walk and stop by the “Moon Beholders” mural located at the end of the Japanese American National Museum’s Plaza. This larger than life mural by Katie Yamasaki is a hidden Instagram-worthy picture moment sure to make at-home friends jealous. ECONOMICS: Subtract the costs of hotel and travel fees from long-distance spring break trips, and add that money back into your wallet by riding Metro to Little Tokyo. Conveniently located only a few steps away from the Gold Line’s Little Tokyo/Arts District station, Metro provides hassle-free travel and more money to spend on fun activities. Two children under the age of five may travel free with each fare-paying adult on Metro’s bus or rail. ELECTIVE – Taste of Little Tokyo: Donuts are a delightful treat and definite crowd-pleaser, and newly opened Donatsu is a twist on the traditional. From flavors like Matcha-Pistachio and Churro, there isn’t a wrong choice at this vegan donut shop. Or, visit a Little Tokyo staple, serving the neighborhood for over 100 years and known for its family tradition and style, Fugetsu-Do is a Japanese confectionary that crafts delicious mochi and manju. Available till March 31st, try their spring special, sakura mochi inspired by the Japanese cherry blossoms. HISTORY: The nationally declared Women’s History month takes place every March with International Women’s Day recognized on March 8. Holding that same spirit, the Japanese American Cultural & Community Center (JACCC) is celebrating Hinamatsuri (Girl’s Day) on March 3rd! Families are welcome to celebrate the happiness, growth, and good health of girls everywhere, with a fun-filled day of Culinary Arts, Cultural Arts, and Martial Arts; because girls kick too! LIFE SKILLS: No longer are the days of Home Economics classes, and for that we are grateful—so are the women who own Leola Lace and Monkey Pants in Little Tokyo. Grab a new, chic dress or necklace from Leola Lace, loved for its high fashion styles at affordable prices. Monkey Pants, as eclectic as the name suggests, is home to the kids’ next cool look for school and authentic Japanese housewares for gift items.